If you're looking for a nice COMPLETE lift to give you a little extra height, you've come to the right place! 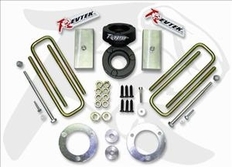 RevTek leveling kits are an easy solution that easy to install, safe to use, and best of all, they maintain factory ride quality. This RevTek Suspension COMPLETE leveling kit achieves lift for the front of your truck with a set of coil spring spacers (you will have to compress your factory springs to install these!). This will add 3" of front lift to the truck. The rear is lifted 1 1/4" with new rear lift blocks and longer u-bolts. Carrier bearing and differential drop spacers are included in the kit to ensure proper ride quality. 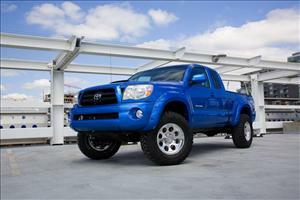 The part number for this RevTek Suspension front lift kit is RevTek 426 and it fits 2005-2015 Toyota Tacoma 4WD. It lifts the front of your truck up 3" and the rear 1.25", giving your truck a more level stance and allowing you to safely run up to a 32" wheel .